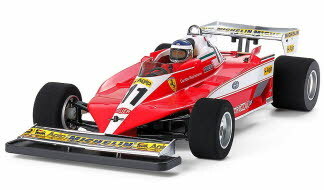 The sleek and powerful Ferrari 312T3 made its racing debut in the 1978 South African Grand Prix. Underneath it's aerodynamically polished, wide body lay a 3-liter horizontally installed 12 cylinder engine with 510 horsepower of output. With drivers Carlos Reutemann and Gilles Villeneuve at the wheel, the Ferrari 312T3 took a total of 4 victories for the Grand Prix season and took second place in the 1978 Constructors Cup. Chassis employs FRP half double-deck F103 chassis. Front independent kingpin coil suspension coupled with rear FRP rigid coil spring suspension. Kit comes standard with high-efficiency ball differential gears. Super-durable resin body and a spare transparent body are included with kit. Diff. gear system: Rear ball diff.